The Little Black Books return! Harking back to the original release of Traveller in the 70's, the Little Black Books from Mongoose bring the latest version of Traveller to your gaming table in a handy and collectible pocket size. 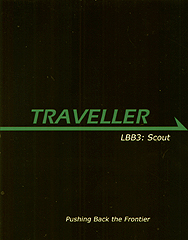 Scout is a detailed expansion for the Traveller game, and continues the line of core books expanding the main rules to give you more options, and depth of play. This book is dedicated to Scout characters, providing them with new career options, equipment, and detailed exploration rules. Characters will be able to scan planets and asteroids to gain a wealth of detail about their surroundings, survive in the harshest environments, and explore mysterious worlds in the furthest depths of space - literally going where no one has been before!